The world stopped. It felt like my own will melted away, my feet, my heart froze only to start melting the next second, to start rejoycing..........such beauty. My allergies keep me from filling The House in the Woods with fresh flower, but no allergy can keep me away from a flower studio like this. Especially when given so many allergy-free ideas. I love people who are creative enough to come up with such simple ideas. Eggs in a soft nest of ivy. Now I know what Marta and I will be doing before Easter. ......but this time only to look at the blooming, bloodred camelias through the windows. I have another trip sceduled to Copenhagen in April. Then I think I will visit both Erik Buch and Tage Andersen. Will you join me? About 30 years ago I visited Copenhagen together with two friends. We took the boat down from Oslo and during the night on the ship I got a fever. We were to take the same ship back to Oslo the next night, and you are not allowed to stay on board the ship while it is in the port. Fever or not, I left with my two friends for shopping and coffees and friendship. Looking back now, 30 years later, I do have alot of sweet memories from our trip, and I did manage to do some shopping, from Eva Rosenstand & Clara Wever's embroidery store (I'm not sure I remember their names correct) I bought an embroidery kit of Nyhavn (The New Port) and when I came home and then got married to Terje a few weeks later, this embroidery was the first one I finished for the home we started together. My two days in Copenhagen this week were busy, most all my time was filled with meetings. But to my great pleasure a room was booked for me at the Seamen's Home in Nyhavn. Frozen memories melted and came flooding. Photos: the first one is taken through the window in the reception area at charming Sømandshjemmet, the third one is the view from the window in my room. Torgeir came home to have dinner with us yesterday, and to talk about books and travels. One thing lead to another, and using my computer he ended up booking two trips. 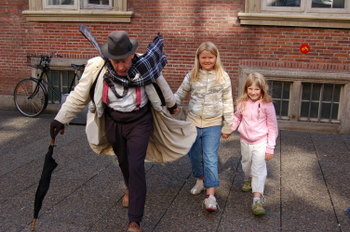 He will be going to Iceland in April and will then be able to watch Agúst in Oliver Twist, and he will travel to Croatia in August........with the rest of us. My mother's birthday was filled with presents, one of them was not one she recieved but instead is giving out, to children and grandchildren. A week together in Dubrovnik/Croatia in August. My parents did the same 11 years ago, when 18 of us went to Denmark, then again 5 years ago when we were also 18 spending a week together in Malta. I don't know how many we will be this time, so far we are 17. I have bought Rebecca West's Black Lamb and Grey Falcon, a Journey Through Yugoslavia from 1942, and have started the travels there in my dreams. We have added another week to the one from my mother and will be travelling around in the country. Another book I am reading right now is Mirror to Damascus by Colin Thubron, from 1967. I am reading the Damascus book for a very spesific reason, but that's a story from another day. Just now I am on the airport on my way to Copenhagen, with a 1935 small book in my hands; Pocket Pointers on Copenhagen by Rasmus Naver. Where do your dreams and travels take you today? Morning in Copenhagen. Rainy. I will be busy with meetings all day, but hopefully I'll be able to post from the airport when I go home today. The last stop during my 4 hours in Copenhagen, a mass for Climate Justice in the cathedral, with the Danish Queen, with bishop Desmond Tutu, with Archbishop Rowan Williams......and alot of others. When we were queeing outside the cathedral, my friend Sindre Eide played Oh What a Wonderful World, right in front of a melting polar bear. Only a very few of the thousands of visitors in Copenhagen that Sunday had got tickets for the mass, most of the Norwegian activists had to watch it all on a huge screen outdoors. I was among the lucky ones. A few days before we left from Norway, I got an email with a ticket, my name written on it, and information that the ticket was personal. The first thing I realised after we left the ship was that I had forgotten my ticket....in a plastic file in my suitcase. We were 1200 people leaving the ship, I sent an sms to my friend Estrid, Sindre's wife, who had sent me the email with the ticket. "Will you believe this Estrid, I forgot my ticket on the ship!!!!!!!" Seconds later I got a reply:" Don't worry, I printed out your ticket just in case. Let's meet in front of the polar bear before the mass"
How good to sit down in the cathedral before the service started. In silence. In prayers. In admirations of Thorvaldsen's statue of Christ. And to be proud because my friend Olav Fykse Tveit has become the new Secretary general for the World Council of Churches, from January 2010. I could have spent hours in Tage's flower gallery. I would have sit down with a mug of hot chocolate, a book, my travel diary.....or just in silence. One of the peacocks would keep me company, new camelias would bloom.......it is all in my dreams. This time I had only four hours in Copenhagen, and I had alot to do. Next on my list was lunch with Preben. Hurrying back to Rådhusplassen I walked along Strøget, the main shopping street in Copenhagen, and there I found it.....my childhood dreams. Moving Christmas decorations. With children's noses glued to the windows. I could have forgotten the time, but Preben is too precious to me. I met Preben a few years ago through some HIV-AIDS work we both do for our churches. Preben is HIV positive. It didn't take Preben long to honor me as "my Norwegian big sister"........something I love to be. I got an email from Preben before I left for Copenhagen. "Let's meet for lunch at noon. I want to take you to Cafe Oscar, a gay pub. Is that okay?" From Cafe Oscar we could almost see Rådhusplassen where bishop Desmond Tutu took part in an open meeting. Preben and I sat inside the cafe, missing the meeting, missing Tutu's speech, but life is like that - you can never get everything. Friends are flowers in your garden. I love colours. I'm sorry I have to go back on the promise of more ornaments. Christmas is too close, my to do-list is too long. Sailing with a ship from Oslo to Copenhagen means that you have a few hours to spend in the city before you have to be on the shio sailing north again. Shuttle busses took us from the ship in to town, and when I looked at my watch I soon counted that I had four hours in the city. And a list with three important! things to do. I was lucky though, the artist himself, Tage Anderson, was down in the basement of his shop. Working with his arrengemnets. Time stopped when I followed his hands setting up a display. Then the incredible happens. The front door opens and out comes Tage's apprentice, the nice young mand I meet on every visit to the gallery. "Good morning. Are you opening the shop?" "Yes madam, just a second." Crazy about socks...is this a Camelia? Early December morning on the deck of Pearl of Scandinavia. To greet a new morning. To greet a new land. At first my only company was one other morning bird with his camera and two Indian guys with too little clothes for the cold Nordic morning, but with smiles happy and broad enough to melt the ice on the poles. Slowly more people came out from the inside of the huge ship, and when we arrived at Copenhagen harbour, 1200 climate activists were peacefully gathered. Peacefully yes! Quiet no! Grimstad Gospel Choir was on the boat with us, and before we reached land, they had sung, dances and taught us all a new climate song. Written for the occation. We were all given rythm instruments (wodden hammers) and did our very best to let all Copenhagen hear our arrival. I sang. I drummed. And I took a walk all by myself to let my tears run. I am not good at showing my tears. Politicians, man and women with power, world leaders - listen to us, it is still hope. We are so many who wants to take part in saving the world. I am just one of several billions, still I can do my share. I know many of you are missing my advents posts. They will be back, but right now my heart is too filled with impressions from Copenhagen. Lets join forces to save the world! We are spending the week-end at our cabin, so there have been no chance for blogging. Here comes a nice summer memory meanwhile. 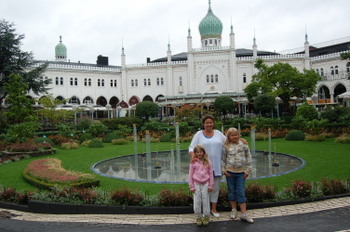 One day in August was spent in Tivoli in Copenhagen where the girls (our Marta and cousin Mathilde) ran around playing from morning till midnight. I have my own childhood memories from Tivoli and have loved to take our kids there to give them some of the same feelings. 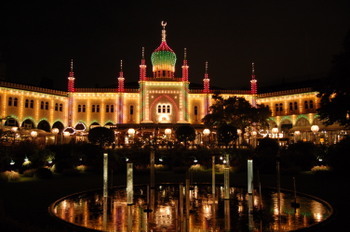 Tivoli changes trough the day, and at night it is like a fairy tale with all the flowers and lights. So the girls were not the only ones "running around, playing", though my run was more with the camera in my hands. I never get tired of walking around in foreign cities, listening to street musicians, watching jugglers, artists dressed up like statues, or acting like this charmeur. Or just sit down on a bench somewhere watching the living of life itself. Life itself amazes me. It is everywhere. You should never be taken for granted.